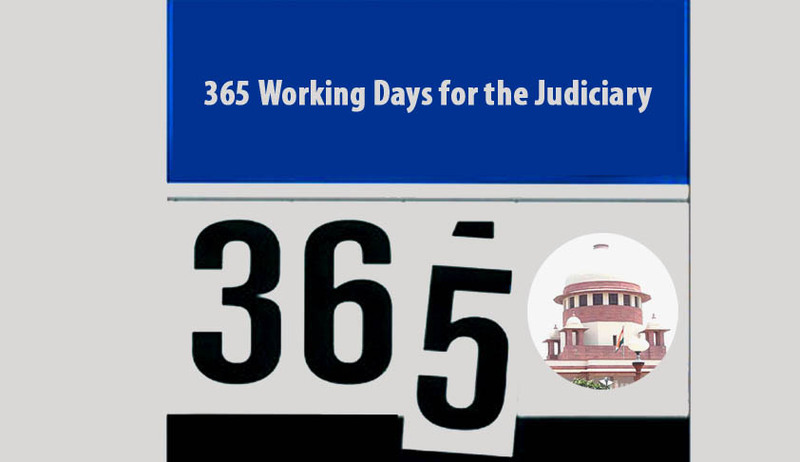 The Chief Justice of India has set the machinery in motion, to ascertain the views of the entire legal fraternity so as to put his revolutionary idea of “365 days a year” into motion. Earlier in May, he had suggested that the justice delivery system should function round-the-year, with minimum adjournments during the hearings. CJI R.M. Lodha, in a letter to the Chief Justices of the High Courts, reportedly asserted that the judges should be given choice of holidays and vacations. The letter contrasted people with legal problems and people in pain and said that they both “want relief and they want it as quickly and as expeditiously as possible”. He had also approached Biri Singh Sinsinwar, Chairman of the Bar Council of India which embodies the interest of 17-lakh lawyers, in order to consider the views of State Bar Councils, Bar Associations and members of the Bar and give a report. However, the lawyer community articulated its doubts, disagreeing with the suggestion “in absence of modality to implement the idea." TOI reported that a meeting of the heads of various state bar councils saw practical upheaval against the idea. The suggestion was rejected with the Chairman stating, "It is not possible for advocates to attend court for all 365 days. It is neither practical nor feasible for an advocate to work throughout the year without rest." The committee started getting critical of the CJI, who has a very short tenure of five months. The BCI instead suggested extension of the working days and hours of the courts to maybe 210 days instead of 365 and stated that this will also be enough to reduce the backlog of cases. As a related answer to the problem, Sinsinwar also stated that the lawyers have come to an agreement with regard to establishment of Advocates' Academy in each state, similar to judicial academy, to provide legal education to advocates all over the country. Additionally, a resolution to provide a stipend of Rs. 5,000 for new advocates for at least five years, along with setting up of an e-library in each trial court was reportedly put forward. Livelaw had reported that the legal fraternity in Mumbai and Kerala had opposed the idea since its inception. However, with this verdict by the state bar councils, the implementation seems far from execution. Advocate General of Chhattisgarh recommended setting up of a committee comprising of reputed advocates to scrutinize the proposal and carry out the interactions with the heads on issue. However, no consensus could be reached on the issue, with the lawyers moving on to the discussion about toll exemption for the “social service” rendered to the community by the lawyers. Justice Lodha had put forward the proposal keeping in mind the 60,000 cases pending in the Supreme Court and 42-lakh cases pending in the High Courts of the country. He envisaged a speedy and free justice delivery system working 365 days a year, characteristics, most often than not, missing from the process of justice delivery in India. The proposal could actually prove productive to clear the log jam of cases. If 15 benches hear cases for 193 days a year, it comes to 2,895 benches a year. But if 10 benches sit for 365 days a year, it would result in working of 3,650 benches, leading to an increase of 26%. The Chief Justice had also seen this as an opportunity for young advocates to test and sharpen their skills. However, the dialogue seems to be failing, with the entire lawyer community against the implementation.